Professional and knowledgeable technicians plus a service-oriented family business are what makes us a 15+ year customer of Rose Pest Solutions! Informative,friendly and professional. A pleasure to do business with. Very effecient and responds in a timely manner. Excellent communication, they take time to answer questions and explain the what, where, when, and why. Great People nice to work with. Fast, efficient, friendly, knowledgeable, reasonably priced. I was told you don't do bats and I might possibly have bats. Technician did place mice traps to see if there are any. I was told to call in 10 days to have someone come out to look at traps. Why didn't he do that? I didn't see him treat the breezeway and he didn't ask to go into garage. When I called for service I was told it would be inside and outside the house plus the garage. He did point out a hole under a window that I needed to block/close up...he started but ran out of caulk....I thought this was included also...why wasn't he prepared? Why did I have to tell him I bought service - was there a lack in communication? Thinking about cancelling already and calling Orkin or another service in the yellow pages. Easy to work with and friendly service techs! Thanks. Randy was very knowledgeable and friendly. He showed up on time and stayed with the challenge (bees!) until situation was rectified. Great customer service from the first phone call to the service call. Friendly service. Was concerned about our issues. It was an OK experience but we still have the bugs. So what am I suppose to say. Randy was very thorough and knowledgeable. It was a good first time experience. The service was very good, Joanie was a pleasure to work with. 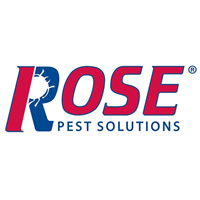 The people at Rose Pest Solutions do a great job of minimizing insect pests around the exterior of our home. I do not hesitate to recommend them to anyone who has a problem with spiders or insects. We recently began using Rose Pest. Great people to work with. Very efficient, and professional. I have been using Rose for 10 years. I liked the individual attention Dana gave me and I felt confident that my home was protected! I was on a quarterly service till this year being 2 times a year feeling that I am not getting the amount of pests as I did before. We have used them for the past three years. They have always provided quick and efficient services for us. Excellent work! Used for years always do a through job. I never know the guy was here until I see the paperwork in my door. I am a property manager and whenever I call Dana he always takes care of things for us right away! I can always count on him and they have very competitive prices.